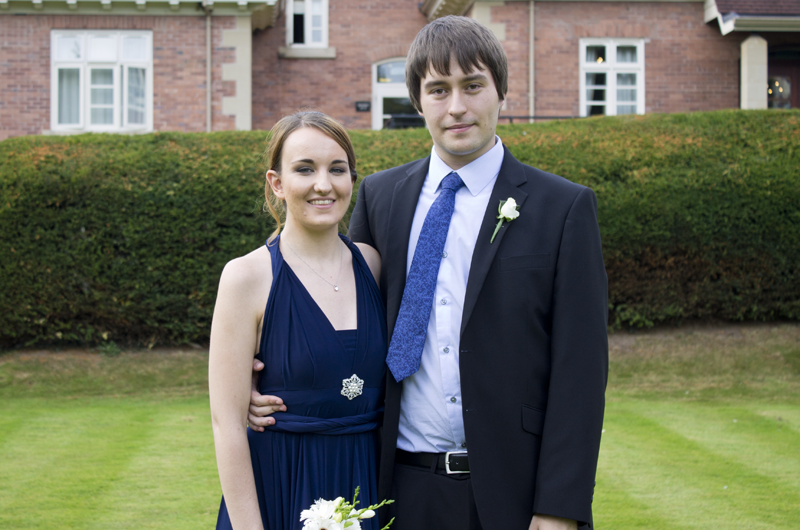 As I mentioned in the latest edition of The Weekend Blog, I attended my cousin Tracy’s wedding this weekend. She married David on Saturday in Shrewsbury Cathedral and I was one of the bridesmaids, which meant I got to wear this stunning dress. The dresses were from Two Birds. Essentially, it is one dress that can styled in many different ways. I wore mine in a style called “Grecian Twist” which has a gorgeous twist down my back. It ended up being a great choice as the style held up well all day and night. We then added a broach as a final touch and Tracy gifted us jewellery to accompany our outfits on the day. I thoroughly enjoyed having my hair and makeup done. We wore our hair in buns, held together with hundreds of hair grips. I made a mental note of all the makeup products that were used as I’d love to be able to recreate the look someday (even though it won’t look half as good!). Following the ceremony at the cathedral we hopped on the bus and headed to the hotel where the reception was being held. We had our photos taken and Tyrone followed the photographer with my camera to take a few shots of us. We managed to get a lovely photo of the two of us and on of the five of us (i.e. 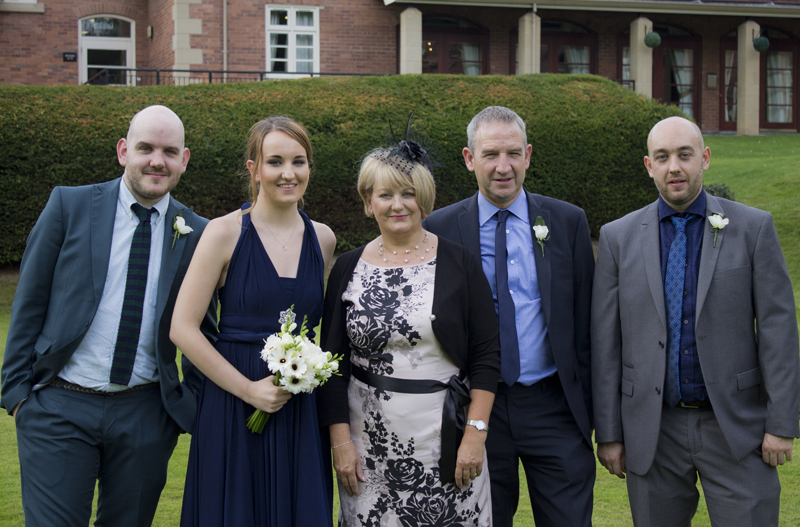 my mum, dad and my two brothers). We had a lovely meal in the afternoon and then a buffet at night, and by the end of the evening I was full of food and alcohol. So much so we even managed to get Tyrone up and dancing. One of our favourite things was the photo booth which resulted in some hilarious photos that I think I will laugh at forever. Aw sounds like the wedding was fun! I will be going to one in a couple of months but I won’t be a bridesmaid. Still planning on dressing up though. 😛 I went to my friend’s wedding in February and they had a similar photo booth thing with some props. LOL. You and Tyrone look cute. It is so difficult for me to get Nick to dance, omg. I’ve never been in a photo booth like that before so it was a lot of fun! Thank you! I’ve been meaning to comment on all your previous blog posts, but with my internship finishing up i have been super busy, finally I have a moment though. I have seen those dresses on Pinterest. I LOVE them. I think they are the perfect bridesmaid dress because you can use them as a dress for other stuff afterwards and it will look like a completely different dress. I am happy I am not the only one who needs to get some alcohol in their boyfriends system to get them to dance. 😛 I think it is a shy thing cause Chris is a great dancer. Hey, don’t worry, once I start work you won’t hear from me for years!! Glad you like the dresses! I barely ever get to dress up in fancy clothes so it’s such a novelty for me, but I really enjoy it. Thank you! I think as all bridesmaids were brunettes, navy was the perfect choice of dress colour. Glad you like the dress! I don’t get to go to weddings very often but I really felt like I could let my hair down at this one as I was surrounded by family…and they already know what I’m like when I’ve had alcohol!! The wedding looks like so much fun! I love your dress – the colour is beautiful. I think I need to invest in one of those multi-way dresses, but I bet I’d fail at doing anything decent with it. I’m sure I’d get tangled up. Love the photo booth pictures! I would highly recommend the Two Bird dresses. They come in a variety of colours and they are also available in shorter lengths. I hope to get some more wear out of mine. We had to have rehearsals to practice putting on each other’s dresses!! What a lovely dress you have! I hope you had a wonderful time, the props in the photobooth look really fun! The family picture is lovely, it’s nice to have pictures like that so you can treasure little moments! Thank you! The last photo we had of the 5 us together was taken in 2007 (I think) and we’ve all changed so much since then. You look super lovely and the wedding sounds like fun and beautiful. Weddings always tend to be like that and I’m glad. The photobooth sounds awesome. I recently got into one, but alas, the pictures are too small but I plan on uploading them one of these days. 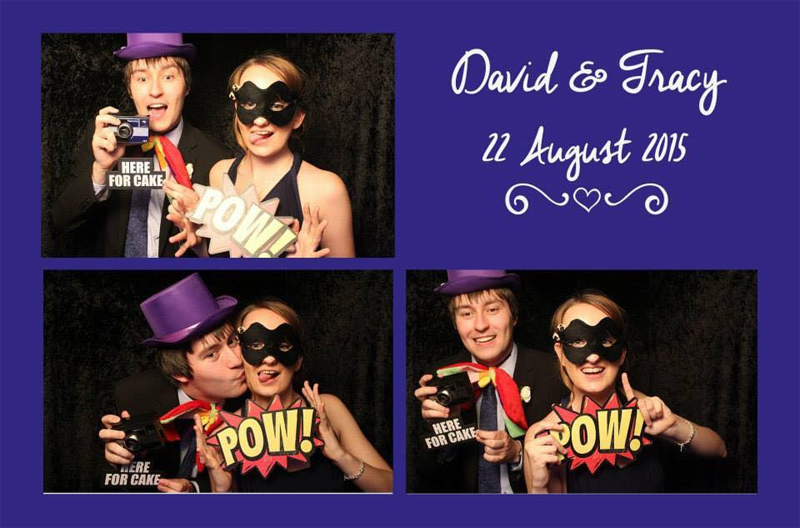 The photobooth set up was great because it printed out two photos: one to keep and one to put in the guestbook. And then they were uploaded to Facebook so we could all tag ourselves on there. You looks great – what a fun idea for bridesamaid dresses to have lots of different ways to wear them! I’m surprised I’ve never heard of it before! Thank you! I think the dresses are such a brilliant idea. It made dress shopping and fittings super easy. I totally loved your photos! And you and Tyrone look so sweet! I hope you had a lot of fun at the wedding! Thank you! I’m glad you like the dress. Ah lovely, I love a good wedding and those two birds dresses are so clever aren’t they!